Home / -Listen- / Rachel Sage / Listen: Rachael Sage Covers Howard Jones' "No One is to Blame"
Listen: Rachael Sage Covers Howard Jones' "No One is to Blame"
Rachael Sage is getting ready to release her new album, Myopia, on May 4 and has on the road opening for Howard Jones over the last couple of months. On Thursday (March 29), she released a cover of Jones' "No One is to Blame", a track from the new album. Jones was on board with the recording, saying "I am absolutely thrilled by Rachael’s version. She has really put her own original stamp on the song." 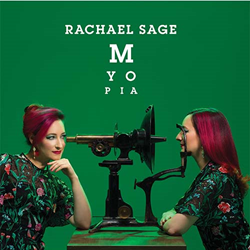 Myopia is Sage's 13th studio release and first full length album since 2016's Choreographic. Last holiday season, she released the EP Joy! which contained both traditional and newly written songs for the season. Sage calls Myopia a "warm-weather record. These are songs about getting out there, thawing things out, and unearthing the truth. Sometimes you can’t do that in the dead of winter. But when the sun is shining, even the murkiest future appears hopeful."